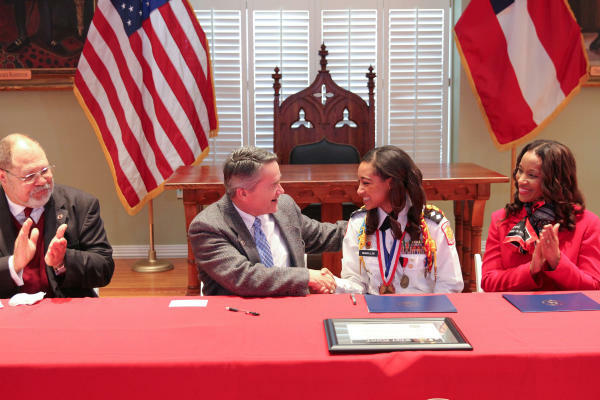 (Milledgeville, Ga.) Georgia Military College prep school senior Calli McMullen has received a fully qualified acceptance into the United States Military Academy at West Point and will be a member of the Army West Point Women’s Track and Field Team. On Wednesday, January 20, U.S. Congressman Jody Hice recognized McMullen and congratulated her as she signed her pledge of commitment to attend West Point in the fall. The Legislative Chamber of the Old Capitol was filled with McMullen’s family, friends, and teachers, and leadership from GMC and the community, who all wanted to witness this historic event. Calli is GMC prep’s first female to receive a fully qualified acceptance into any U.S. Service Academy. Calli McMullen is the daughter of Calvin and Rebecca McMullen, of Haddock, Ga. In addition to an outstanding record of athletic excellence, McMullen also serves as the Battalion Commander for her high school. Pictured, left to right, Left to right: Calvin McMullen, Calli McMullen, Congressman Jody Hice, and Rebecca McMullen.